Any and all proposed legislation referenced herein on this website or listed on a National Council agenda is subject to amendment, postponement, suspension, and/or may fail to be passed by the National Council among other legislative actions. Even if proposed legislation is duly adopted by the National Council the legislation is not considered a final law or action until after the passage of ten (10) days after the vote as any legislation enacted by the National Council is subject to veto by the Principal Chief pursuant to the Constitution of the Muscogee (Creek) Nation. The National Council expressly disclaims that the proposed legislation contained herein will become the enacted law of the Muscogee (Creek) Nation. Any materials published on this website are intended for reference use only, do not constitute legal advice, and may not represent the official opinion of the Muscogee (Creek) Nation. 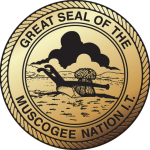 All final laws are published in the Muscogee (Creek) Nation Code Annotated. REGULAR SESSION – DECEMBER 17 – 10:00 A.M.
PLANNING SESSION – DECEMBER 13 – 6:30 P.M.
LNC AGENDA- DECEMBER 13- 6:00 P.M.
BFJ AGENDA- DECEMBER 7- 6:30 P.M.
LNC AGENDA- DECEMBER 6- 5:00 P.M.
HEW AGENDA – DECEMBER 5 – 2:00 P.M. REGULAR SESSION – NOVEMBER 19 – 10:00 A.M.
PLANNING SESSION – NOVEMBER 15 – 6:30 P.M.
HEW/LNC – NOVEMBER 15 – 6:00 P.M.
BFJ AGENDA – NOVEMBER 10 – 6:30 P.M.
BFJ/LNC AGENDA – NOVEMBER 10 – 6:00 P.M.
LNC AGENDA- NOVEMBER 8- 6:30 P.M.
HEW AGENDA – NOVEMBER 7 – 6:30 P.M.
QUARTERLY SESSION – OCTOBER 29 – 10:00 A.M.
HEW/BFJ AGENDA – OCTOBER 25 – 6:30 P.M.
BFJ AGENDA- OCTOBER 20- 6:30 P.M.
LNC AGENDA- OCTOBER 17- 6:30 P.M. EXTRAORDINARY SESSION – OCTOBER 17 – 6:00 P.M.
HEW AGENDA – OCTOBER 10 – 2:00 P.M. REGULAR SESSION – SEPTEMBER 24 – 10:00 A.M.
LNC AGENDA- SEPTEMBER 24- 8:45 A.M.
BFJ AGENDA- SEPTEMBER 24- 8:30 A.M.
PLANNING SESSION – SEPTEMBER 20 – 6:30 P.M.
BFJ/HEW AGENDA – SEPTEMBER 20 – 6:00 P.M.
BFJ AGENDA – SEPTEMBER 14 – 6:30 P.M.
LNC AGENDA- SEPTEMBER 13- 6:30 P.M. EXTRAORDINARY SESSION – SEPTEMBER 12 – 7:00 P.M.
HEW AGENDA – SEPTEMBER 12 – 2:00 P.M.
BFJ AGENDA – SEPTEMBER 8 – 6:30 P.M.
BFJ BUDGET AGENDA – AUGUST 31 – 6:30 P.M.
BFJ BUDGET AGENDA – AUGUST 30 – 6:30 P.M.
HEW BUDGET AGENDA – AUGUST 29 – 2:00 P.M. REGULAR SESSION – AUGUST 27 – 10:00 A.M. EMERGENCY SESSION – AUGUST 27 – 8:30 A.M.
HEW BUDGET AGENDA – AUGUST 24 – 2:00 P.M.
PLANNING SESSION – AUGUST 23 – 6:30 P.M. EMERGENCY SESSION – AUGUST 23 – 6:15 P.M.
LNC/HEW AGENDA- AUGUST 23- 6:00 P.M.
HEW BUDGET AGENDA – AUGUST 22 – 2:00 P.M.
BFJ AGENDA- AUGUST 17- 6:30 P.M.
BFJ BUDGET AGENDA – AUGUST 17 – 6:00 P.M.
HEW BUDGET AGENDA – AUGUST 17 – 2:00 P.M.
LNC BUDGET AGENDA – AUGUST 16 – 6:30 P.M.
LNC BUDGET AGENDA – AUGUST 15 – 6:30 PM. LNC AGENDA- AUGUST 9- 6:30 P.M.
HEW AGENDA – AUGUST 8 – 2:00 P.M.
QUARTERLY SESSION – JULY 30 – 10:00 A.M.
PLANNING SESSION – JULY 26 – 6:30 P.M.
HEW/LNC AGENDA – JULY 26 – 6:00 P.M.
BFJ AGENDA – JULY 21 – 6:30 P.M.
HEW/BFJ AGENDA – JULY 21 – 6:00 P.M. EXTRAORDINARY SESSION – JULY 19 – 6:30 P.M.
LNC AGENDA- JULY 12- 6:30 P.M. EMERGENCY SESSION – JULY 12 – 6:00 P.M.
HEW AGENDA – JULY 11 – 2:00 P.M. REGULAR SESSION – JUNE 18 – 10:00 A.M.
PLANNING SESSION – JUNE 14 – 6:30 P.M.
BFJ AGENDA – JUNE 9 – 6:30 P.M.
LNC AGENDA- JUNE 6- 6:30 P.M.
HEW AGENDA – JUNE 6 – 2:00 P.M. EXTRAORDINARY SESSION – JUNE 2 – 6:30 P.M. REGULAR SESSION – MAY 21 – 10:00 A.M.
BFJ AGENDA – MAY 21 – 8:30 A.M.
PLANNING SESSION – MAY 17 – 6:30 P.M.
HEW/LNC AGENDA – MAY 17 – 6:00 P.M.
BFJ AGENDA – MAY 12 – 6:30 P.M.
LNC AGENDA- MAY 10- 6:30 P.M.
QUARTERLY SESSION – APRIL 30 – 10:00 A.M.
PLANNING SESSION – APRIL 26 – 6:30 P.M.
BFJ AGENDA- APRIL 21- 6:30 P.M.
BFJ/HEW AGENDA- APRIL 21- 6:00 P.M.
LNC AGENDA- APRIL 11- 6:30 P.M.
LNC/HEW AGENDA- APRIL 11- 6:00 P.M.
HEW AGENDA – APRIL 11 – 2:00 P.M. EXTRAORDINARY SESSION – MARCH 21 – 6:30 P.M. REGULAR SESSION – MARCH 19 – 10:00 A.M.
PLANNING SESSION – MARCH 15 – 6:30 P.M.
BFJ/LNC AGENDA – MARCH 10 – 6:30 P.M.
LNC AGENDA- MARCH 8- 6:30 P.M.
LNC/HEW AGENDA-MARCH 8- 6:00 P.M.
HEW AGENDA – MARCH 7 – 2:00 P.M. REGULAR SESSION – FEBRUARY 27 – 10:00 A.M.
PLANNING SESSION – FEBRUARY 23 – 6:30 P.M.
BFJ AGENDA – FEBRUARY 18 – 6:30 P.M.
LNC AGENDA- FEBRUARY 9- 6:30 P.M. EMERGENCY SESSION- FEBRUARY 9- 6:00 P.M.
HEW AGENDA – FEBRUARY 8 – 2:00 P.M.
QUARTERLY SESSION – JANUARY 30 – 10:00 A.M.
BFJ AGENDA – JANUARY 30 – 8:45 A.M.
BFJ AGENDA – JANUARY 28 – 6:00 P.M.
PLANNING SESSION – JANUARY 26 – 6:30 P.M.
HEW AGENDA – JANUARY 26 – 6:00 P.M.
BFJ AGENDA – JANUARY 21 – 6:30 P.M.
LNC AGENDA- JANUARY 19- 6:30 P.M.
HEW AGENDA – JANUARY 18 – 2 P.M.
BF&J AGENDA – JANUARY 14 – 6:30 P.M. EMERGENCY SESSION – JANUARY 5 – 6:30 P.M.